A weed is basically any plant growing in a place where it is not wanted. 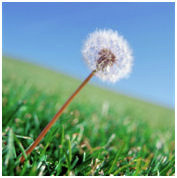 Weeds will battle with your grass for light, nutrients and water so they must be removed. The way Expert Lawns tackle this is to establish the type of weed and then apply the correct herbicide. We use selective herbicides and the two main categories are Systemic & Contact. Contact types kill only the green part of the plants they come into contact with, where as the systemic type is absorbed into the vascular system of the plant. There are a lot of factors that influence the effectiveness of weed killers and you can be rest assured that Expert Lawns will always apply the best product at the right time. After application, you will need to stay off the lawn and keep dogs off for the rest of the day (until the product has dried). We provide Lawn Care and Weed Control & Management Services across Surrey, Hampshire, Berkshire, and West Sussex.